Philadelphia Phillies owner, GM meet with Bryce Harper in Las Vegas. Watch this exclusive report from Action News at 11pm on January 12, 2019. PHILADELPHIA (WPVI) -- Both the owner and the general manager of the Philadelphia Phillies met with one of the Major League Baseball's top free agents on Saturday. Owner John Middleton and GM Matt Klentak arrived home in Philadelphia just hours after a meeting with Bryce Harper. 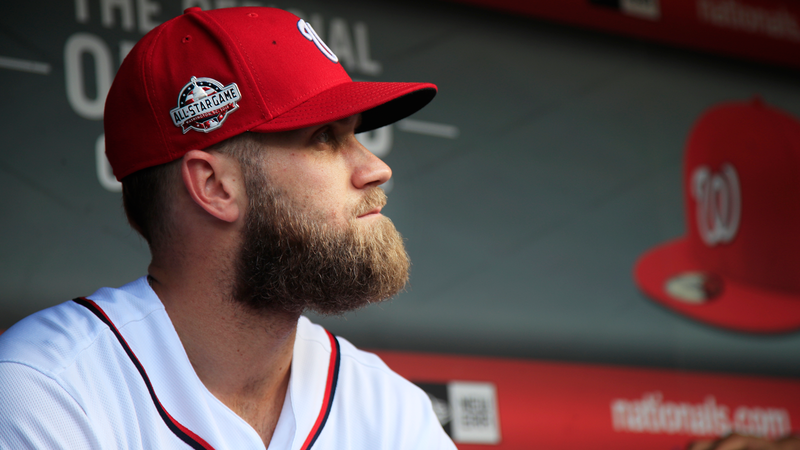 The baseball world has been holding its collective breath awaiting Harper's decision. Action News met with Middleton and Klentak and we asked them how it all went. In this Sept. 26, 2018 photo, Washington Nationals' Bryce Harper, looks at the baseball field from their dug out before the start of the Nationals last home game of the season. "I think it was really positive," Middleton said. "We really got to see the man. We watched the player for years, but we got to understand the man, what he'd be like in the dugout, the clubhouse, the community." "It was really impressive to spend time with him, know him better, answer his questions, we got to ask him some questions, learn about him," said Klentak. "I think that's a really important step in any negotiation, is kind of understanding what the other party is looking for - and now we'll see where it takes us." Harper, 26, is one of the younger players ever to hit free agency with an MVP and six All-Star appearances on his resume.